FILE - Rohingya refugee Yasin Arfat, 6, who suffers from diphtheria, lays on a bed at a Medecins Sans Frontieres (MSF) clinic near Cox's Bazar, Bangladesh. At Balukhali refugee camp in Bangladesh, unclean water, cramped living quarters and squalid conditions create a prime environment for outbreaks of preventable diseases among the estimated 650,000 Rohingya Muslims who have fled strife in neighboring Myanmar. While 900,000 doses of oral cholera vaccine already have been delivered by more than 200 mobile vaccination teams, another contagious bacterial infection, diphtheria, has emerged. "Diphtheria is a vaccine preventable disease. It's an illustration of how the Rohingya population that are living in the makeshift settlements here had very little access to health care in their place of origin in Myanmar," said Kate Nolan, emergency coordinator with international aid group Medecins Sans Frontieres, or Doctors Without Borders. Diphtheria often causes the buildup of a sticky grey-white membrane in the throat or nose. The infection causes airway obstruction and damage to the heart and nervous system. The fatality rate increases without the diphtheria antitoxin. FILE - Rohingya refugees, who suffer from diphtheria, are treated at a Medecins Sans Frontieres (MSF) clinic near Cox's Bazar, Bangladesh, Dec. 18, 2017. "This is an extremely vulnerable population with low vaccination coverage, living in conditions that could be a breeding ground for infectious diseases like cholera, measles, rubella and diphtheria," said Dr. Navaratnasamy Paranietharan, the World Health Organization representative to Bangladesh. Myanmar's health sector is rated among the worst in the world, particularly in the ethnic regions where conflict and poverty have delayed medical development. The Rohingya refugees fled Myanmar's northern Rakhine state after insurgents attacked security forces in late August, prompting a military crackdown that has since been described as ethnic cleansing. Myanmar's government denies it has engaged in ethnic cleansing, and it insists that a majority of the violence and burning of Rohingya villages was done by the Rohingya militants who attacked the Myanmar security forces. "The health care facilities for the Rohingya in Rakhine state are appalling and just a small amount of the needs were being met, even before the attacks in August," said Rohingya expert Chris Lewa of the Arakan Project, a human rights organization that monitors and documents the situation. According to Lewa, the impoverished Rohingya population in northern Rakhine say they are treated with discrimination by Myanmar medical staff at government hospitals and face severe movement restrictions when traveling to health care facilities. FILE - Rohingya children gather at the Dar Paing camp for Muslim refugees, north of Sittwe, western Rakhine state, Myanmar. Lewa points to Myanmar's Maungdaw District, where the army conducted so-called "clearance operations" following deadly insurgent attacks last year. "Health facilities set up by INGOs [international nongovernmental organizations] in Maungdaw have been burned to the ground, which will make it even more difficult for them if and when they are allowed to return," Lewa added. Currently, INGOs are not allowed in the areas outside Maungdaw. Doctors Without Borders has responded to the rapid spread of diphtheria in neighboring Bangladesh by converting one of its mother and child inpatient facilities at the Balukhali makeshift settlement, and at another inpatient site, into treatment centers. "The emergence of this disease is a concern because it contributes to an existing precarious public health situation that we have in the makeshift settlements," Nolan said. Now, potential carriers must get antitoxins and antibiotics to prevent the further spread of the bacterium and kill it. "We need to find all the suspected cases in the camps and get them all here to start the antibiotic treatment and keep them isolated for 48 hours," said on-duty doctor Thomas Hansen. Because the disease spreads easily through water droplets from sneezing and coughing, medical teams are tasked with following up on initial quarantine with visits to a patient's family to trace and treat people who might have come in contact with the disease in the community. FILE - Rohingya refugee children play at the Palongkhali refugee camp near Cox's Bazar, Bangladesh, Dec. 22, 2017. Doctors Without Borders and health partners like the International Federation of Red Cross and Red Crescent Societies are working together to isolate suspected cases. One of the biggest challenges for health workers, however, is getting to remote locations where potential outbreaks can occur. With the sudden influx of the 650,000 refugees, new land clearance has led to huts being constructed well beyond the main roadways. "They live in areas that are difficult to reach. You cannot reach them by cars or Tom Toms [three-wheeled taxis] because of no roads, so they will have to carry their patients to where they can get treatment," said Dagne Hordvei, team leader with the Norwegian Red Cross. "We have an agreement with [Doctors Without Borders] that we take the measles patients from them, and they take the diphtheria patients, with lots of activity going out to the communities to try to reduce the speed of the spreading of diphtheria." As Bangladesh's Ministry of Health and Family Welfare — working with the World Health Organization, UNICEF and other health partners — implements a vaccination campaign to prevent future outbreaks of diphtheria, it appears that at least some of the next generation of Rohingya will have protection from preventable diseases. "We are working with partners to ensure that clinical guidance is available to health workers, and that there are enough beds and medicines for those who get sick. But the only way to control this outbreak is to protect people, particularly children, through vaccination," said the WHO's Paranietharan. As of December 21, Doctors Without Borders has seen more than 2,000 suspected diphtheria cases in its health facilities, and the number is rising daily. Most of the patients are between the ages of 5 and 14 years old. 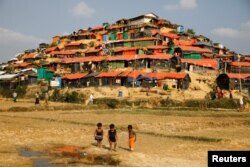 More than 20 Rohingya in Bangladesh have died from the disease.